It’s the day of the 2019 Grand National and here are all of the betting offers available. This is our fourth consecutive year of live blogging offers. Now it’s Saturday, we don’t foresee any further changes. Who is Paying the Most Places on the Grand National? What Do I Need To Know For Betting On The Grand National? Today it’s the Grand National, and eight of the top 20 bookmakers have withdrawn their offers for the day. Here are the top five welcome offers that are still available, and are great for using on the Grand National. You won’t get better than these. Our homepage has a full list of betting sites if you want to see the others. Bet £10 on a horse and get a £10 free bet to back another when you visit via My Betting Sites. Terms and Conditions 18+ New UK+IRE customers. Paypal and certain deposit types and bet types excluded. Min £5 bet within 14 days of account reg at min odds 1/2 = 4 x £5 free bets. Free bets valid for 4 days on sports, stake not returned, restrictions apply. T&Cs apply. Bet £10 on the Grand National and get a £10 free bet when you visit via My Betting Sites. Terms and Conditions NNew customers only. Minimum £10/€10 win or each way on The Grand National. Free bet from 9am Sun 7th April 2019. (4 day expiry) Free bet, currency and payment method restrictions apply. Full terms apply. Money back your first horse racing bet loses when you visit via My Betting Sites. Terms and Conditions New customers only. 18+, BeGambleAware.org. Min deposit £10. Money back as bonus. Wagering requirements: Sportsbook 3x at min. odds of 1.40 (2/5), Casino 25x. Only one bonus can be used at a time, Sportsbook bonus must be wagered before using the Casino, unless the bonus has been forfeited. Bonus will expire after 7 days of opt-in. bet365 is the most popular UK bookmaker. Register now and enjoy many benefits. Terms and ConditionsNew Customers only. Up to £100 in Bet Credits. Sign up, deposit £5 or more to your account and bet365 will match your qualifying deposit in Bet Credits when you place qualifying bets to the same value and they are settled. Min odds/bet and payment method exclusions apply. Returns exclude Bet Credits stake. T&Cs, time limits & exclusions apply. Get a 50% matched deposit bonus up to £50 when you visit via My Betting Sites. Here is the final list of what is available for existing customers. There are offers from bet365, Boylesports, Betway, Betfair and Winner. In our opinion, this is hands down the best offer available today. This Grand National Money Back Offer is only available to eligible bet365 customers who opened their account before 23:59:59 UK Time on Wednesday 3rd April 2019. Tiger Roll is the favourite to win today. While he is the most likely horse to win out of the pack, his odds are really short. Those who have him in the sweepstake will be delighted, but those betting with their money will probably want something priced bigger. If you fancy one of the longer priced horses, then Boylesports could be a great option for you. They’ll give you money back as a free bet if your horse finishes 2nd to Tiger Roll. You need to opt-in first, and the maximum refund you can get is £20. It will be paid as a free bet. Plus Boylesports still have their welcome offer live. Yes, we have a separate section later for who is paying the most places on the Grand National, but because it’s so good, we had to include it here. Unibet are the only bookmaker today to offer a massive 7 places on the Grand National. You can do this in conjunction with their new customer offer listed above. Bet £10+ on the Grand National and Betway will give you 40 free spins on the ‘Final Furlong’ slots. If you’re not lucky on the main race, you might be lucky on the slots! Betway have withdrawn their new customer welcome offer, so you won’t be able to do that in conjunction. If you’re backing Tiger Roll, this could get you some extra value. Back a winner at odds of 3/1, and Betfair will give you a £25 free bet. You’ll receive your free within 2 hours of the bet settling and you’ll have 48 hours to use it after the Grand National. There is plenty of Premier League to use it on this weekend. This is similar to Betfair. This is not an offer for the Grand National, but it’s available for the first televised race on ITV at Aintree. If your hose loses, then Betway will refund your losing stake as a free bet. You could take advantage of this for the first race, and then if you don’t win, use your refunded bet on the Grand National. A maximum refund of £10 applies. There are 40 runners today, so many people will back a few horses. If you hold a 10Bet account, then take advantage of this offer. Opt-in first, and then when you bet £5 five times, you’ll be rewarded with a £5 free bet. Your qualifying bets can be used on any of the races earlier in the day, which are all televised on ITV. On top of that, 10Bet will give you money back if your horse falls in the race, up to £10. Everyone knows the Grand National is a demanding race. The fences are much more forgiving then they were in the race, but it’s a long race nonetheless. If you back a horse in the Grand National today and it falls, the jockey is unseated or brought down, then Winner will give you your money back. The max refund you can get is £10, and it’s awarded as a free bet. 7 places is the best available for the Grand National today. It’s offered by Unibet. The rest are offering 6, 5 and 4 places. We don’t foresee any further changes on places offered. Bookmakers changed the number of places they were offering daily in the run up to the Grand National. You will need to check your betting slip, rather than this table if you’re looking it up after the race. Remember, this is not guaranteeing that you will get the best odds across all bookmakers. Instead, if you back a horse and the odds get better after you back it, then when the race starts, you’ll get those new odds. You can get extra winnings this way. The final field has now been confirmed, so NRNB has been removed by most bookmakers. What Do I Need To Know When Betting On The Grand National? 1) When is the 2019 Grand National? The Grand National takes place today, at 5.15 pm. 2) What TV Station is it on? The Grand National is broadcasted live on ITV One. 3) How Many Runners are there? There are 40 runners, and the final list has already been confirmed. Back up races will replace any non-runners. 4) Who Is the Favourite This Year? Tiger Roll is the favourite. Earlier in the week, he was as short as 4.50. Now you can back him at 6.00. This is a really low price, so many tipsters would look elsewhere for value. 5) How Often Does the Favourite Win? Not often at all. In the past 10 years, the favourite has won once. The Grand National is more like a lottery than anything else. 6) How Do Betting Odds Work? We’ve got a great article on how betting odds work. You can read it here. 7) What Does ‘Each-Way’ Mean? This is a popular way to bet on the Grand National. If you bet each-way, it means you have two bets. One bet is for the horse to win, and then the second bet is for it to finish in the first ~5 positions. Because there are so many runners, this can make it more fun. Check out our full guide to each way betting to learn more. 8) What Do ‘Places’ Mean? This relates to the above. If you bet for a horse to place as part of an each-way bet, the ‘places’ means the number of positions the horse must finish within for the bet to win the ‘place’ part of the each way bet. ‘5 places at 1/5’ odds means your horse must finish in the top five, and you’ll receive one-fifth of the odds for it to win. 9) What does NRNB stand for? Throughout this article, we refer to ‘NRNB’. It stands for ‘non-runner no bet’ and means if the horse doesn’t run in the race, you receive your money back. This is more common with ante-post betting. 10) What Does ‘Best Odds Guaranteed’ (BOG) Mean? The odds to back a horse has the potential to change. 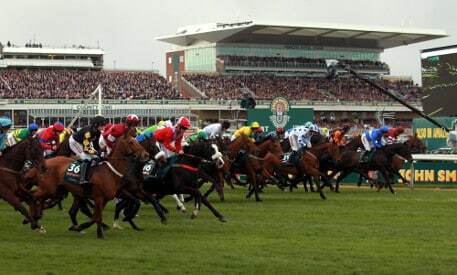 Some bookmakers will offer best odds guaranteed for the Grand National, meaning that if the starting price (SP) is a better price than the odds you backed it at, the bookmaker will pay you out at the bigger SP price if you win. 11) What Does Ante-Post Mean? This refers to betting on the Grand National in advance of the final runners being announced. Around a third of bookies ill withdraw their welcome offer on the Friday/ Saturday of the Grand National. They don’t want to give away free bets for people that are only going to use it on the Grand National then never return. You can still sign up with them, you just won’t get a welcome offer.